Hey all, the draw for the World Tour Finals is out and Roger landed himself in a pretty sweet group. He could have got Andy Murray in his Round Robin but instead has Ferrer, Del Potro and Tipsarevic. This is clearly the better of the two groups and I think Roger should qualify for the Semi Finals now, he should beat Tipsarevic easily and I also think he'll beat Del Potro this time around. The Basel loss is a bit of an anomaly and I think Roger will bounce back. The difficult match will be Ferrer, even though Fed is 13-0 lifetime against the Spaniard I think he might put in a good run at the World Tour Finals again this year and if he wins his first Masters 1000 title in Paris he'll be playing confidently. My picks for the semi finals are Djokovic, Berdych, Federer and Ferrer. Play starts on Monday and I think Group B will be in action on Tuesday, Thursday and Saturaday. This year the final is on Monday, which I'm not a huge fan of but looks like the fairest way of making sure all players have the same amount of days off. 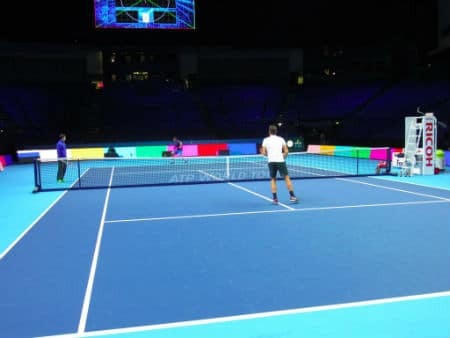 So Roger faces Tipsarevic in his opening match, I'm expecting a comfortable straight sets win, Tipsy withdrew in his quarter final match in Paris again Janowicz (something he makes a habit of) and I'm starting to think he is a bit of a clown. Roger leads the H2H 5-0 so I imagine it will be over quickly, they did have that 5 set thriller at the Australian Open in 2008 but those were bad back/mono times so not a good indicator. What are your World Tour finals predictions? I think Roger at least reach semifinals. But quite possibly defend his title, according to which player passes further from group A! Yeah me too, it’ a good group! Yes, I think that is very good and useful for his confidence at the beginning of competition! I just wonder, if fed had managed to keep the no.1 ranking going into this tournament, he would have had the tough group, with murray, berdych and tsonga. Fed played a smart move by not playing paris, he’ll be fresh for the WTF, easy(ish) draw. All is well. He looks like a man on a mission if you ask me, I just hope he can replicate the performance of the last few years, decimate the competition and be with that cool trophy at the end of it! PS. It is a pity rafa won’t be playing, it’s always good to whoop his arse indoors! I think Fed will get to the semis without much difficulties. I agree with upstairs’ post as he chose to skip Paris-Bercy (and ignore the year-end #1) just to rest up for this; the conditions suit him well and all that so I think he’ll make a good run. Go Rog! Yeah, guess we shall see how he’s feeling tomorrow when he plays Tipsy. Expecting nothing less than a straight sets win. Actually think both groups tough and the route out is only to the semis, which cld be a lottery, depending on whether he wins the group. Delpo has achieved all he wanted this yr, and to get back into top 8 is a bonus for him so think he will quite relaxed. Tipsy seemed out of sorts in Paris and Ferrer may be tired but never seems to be!!! So if Fed beats Tipsy in first match, think he will go on to win the group. The question then is who Wld he face. He will prob not want to face Murray! In the other group, Berdych will look to beat Murray who I think will be raised by the crowd. Djoker is always a mystery in London, and Tsonga can blow hot and cold, so for me, Murray and Berdych are the favs but that first match is ky to who wins the group! Djoker and Murray both off to winning starts. I think Murray beats Tsonga easily too so looks like him and Djoker are qualifying. See what happens in group b tomorrow..
Yeah maybe more than just coincidence they all lost early. Federer has a great chance to claim this title again. I think if Federer is well rested, he will come out on fire and destroy everyone. Murray and Djokovic are a disappointment to this sport by bowing out at Paris and Berdych too! This new guy Jercy seems to be quite talented any thoughts on his talent and game style? I only saw a couple of his matches but he’s got a big serve and not afraid to mix it up by the looks of things. See where he goes from here. Berdych won Paris Masters when he was young and hasn’t won one since so too early to say if hes the next big thing. Maybe a bit too tall (historically don’t do that well)? Although seems to move well for a big guy. Like the fact he plays dropshots and stuff at crazy times. Was hoping he’d beat Ferrer actually. He’s 31-3 combined against Ferrer, Delpo, and Tipsy, so he should make the semis for sure. After that, he could play Djokovic or Murray. If there is one thing I am sure of, it’s that Fed will be fresher than Djokovic, Murray, Delpo, and Ferrer. Decent stat, hopefully 34-1 after he’s done with the group. I see no real threats other than Federror stinking up the joint, if he’s kept in the locker room then should win all 3 matches. In other news, Fed won the Edberg Sportsmanship Award for the 8th time and the Fan Favourite for the 10th straight year. Congrats Feddy! It was pretty much Jesusfed against Tipsarevic today! Served him right, Tipsarevic withdrew against the upcoming Pole while 4-1 40-0 in the 3rd set. Should have just let Jankowic finish the match, what would’ve been a lot nicer. I hope Fed can maintain his level and maybe get his serve % up. Yeah I was happy to see Fed looking smooth. A far cry from Shanghai and Basel that’s for sure. Hopefully it’a an upward curve. If Fed wins in 2 sets v Ferrer, the major question is who will he play in the semis. If Berdych plays a blinder v Djoker ( already thru) then he and Murray ( who shld beat Tsonga) will be counting games to go thru!!! Fed would rather face Berdych indoors but either is tough. Djoker will prob face Ferrer as Tipsy looks like the fall guy in this group! Either way, am praying for straight sets win for Fed over Ferrer who is on the crests of a winning wave and not to be underestimated at all! Congrats to Fed on both awards today! Marvellous! And quick PS, well done to Marray and Neilsen! Fantastic to see! Playing with such freedom and lack of pressure! Yeah Group B could get interesting! Mathematically Tsonga could still get through. Tipsy is as good as out I think. Ferrer will beat him and qualify I believe. I think Fed vs. Murray, Djoker vs. Ferrer. Tough match for Roger if so!